Barrow Systems was called in to a client’s facility where several ammonia releases had been reported. BSI was asked to evaluate what had happened and to make recommendations to prevent additional releases. Upon review, it was discovered that some of the releases were due to monitoring devices providing “false positive” alarms and others were directly attributable to vessel over pressure conditions. In this facility, there are several refrigerant pressure vessels with a combination of single and dual relief valves. All relief valves are piped into a common vent header which is piped outside to a containment vessel. There is an ammonia sensor in the vent header which detects the presence of ammonia in the header near the containment vessel. Determination of a specific pressure vessel or relief valve experiencing an ammonia release proved impossible. There are no operational alerts indicating a relief valve release condition and the vent header was full of ammonia vapor as a result of a release. There was no method for accurately determining and reporting the loss of refrigerant in pounds. BSI recommended the installation of “Tell-Tale” gauges on all pressure vessels. 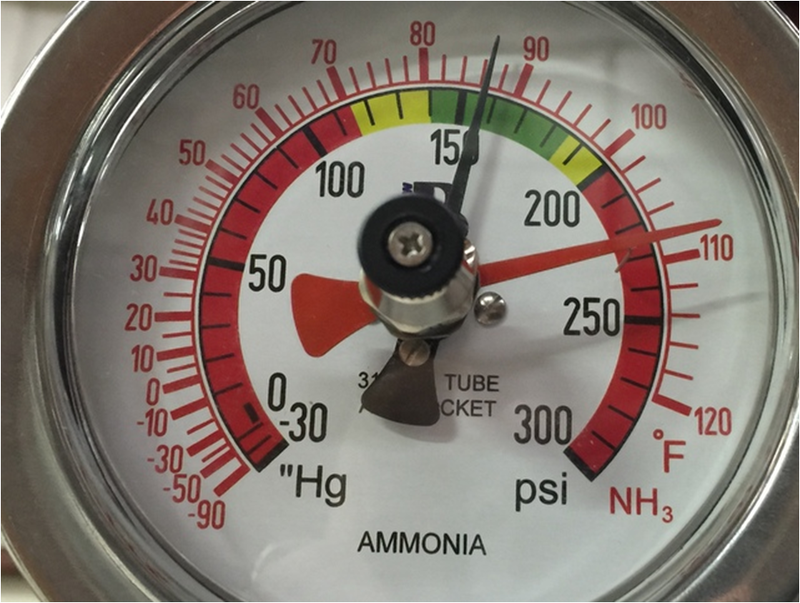 These gauges would indicate if a high pressure condition had been experienced at a pressure vessel. This approach was the most practical at this point and the only reasonably reliable option available. Barrow Systems decided that a better way of detecting vessel over pressure conditions and Relief Valve releases was needed. BSI proceeded to work on and develop a standalone Refrigerant Relief Valve Monitoring and Reporting System©. It’s a twofold system. One part monitors all pressure vessels in a system, and in doing so can reduce the potential for an ammonia relief valve release or maybe prevent it altogether, while the other part has accurate reporting capabilities in the event a relief release event does occur. A standalone system that monitors all ammonia pressure vessels continuously 24/7 regardless of operations or shutdowns. A display that shows the pressure status of every ammonia pressure vessel in the system continuously 24/7 regardless of operations or shutdowns. Every pressure vessel in the ammonia system is identified by name or location. There is a vessel status screen on the HMI, as well as visual indication (stack light) for any vessel that achieves a “Pressure Above Normal” condition. This gives Operations/Maintenance personnel time to respond to the location and condition. The vessel status screen on the HMI will change with a second alarm including visual indication and audible annunciation (stack light and horn) for any vessel that achieves a “High Pressure” condition. Again, this gives Operations/Maintenance personnel time to respond to the location and condition. Any of these alarm conditions can be sent in real time to selected computers, cell phones, printers, overhead monitors or emergency status response systems within a facility. There are interlocks from the RRVMR System that can be incorporated into the facility’s refrigeration and process control systems to suspend operations or shut equipment down in an effort to avoid an over pressure condition. The RRVMR System provides real time notification of any refrigeration system pressure vessel with a status outside normal operating limits. There is no delay in response time due to lack of information about vessel location or pressure, and there is a constant update of pressure on the HMI to allow supervisors to assess the current conditions and appropriate response prior to a relief valve release event. After developing an accurate and reliable pressure monitoring system, BSI also developed a methodology for accurately determining the loss of refrigerant in pounds using ASME certified manufacturer’s relief valve flow characteristics and accepted ASME formulas for determining loss of refrigerant through a relief valve. 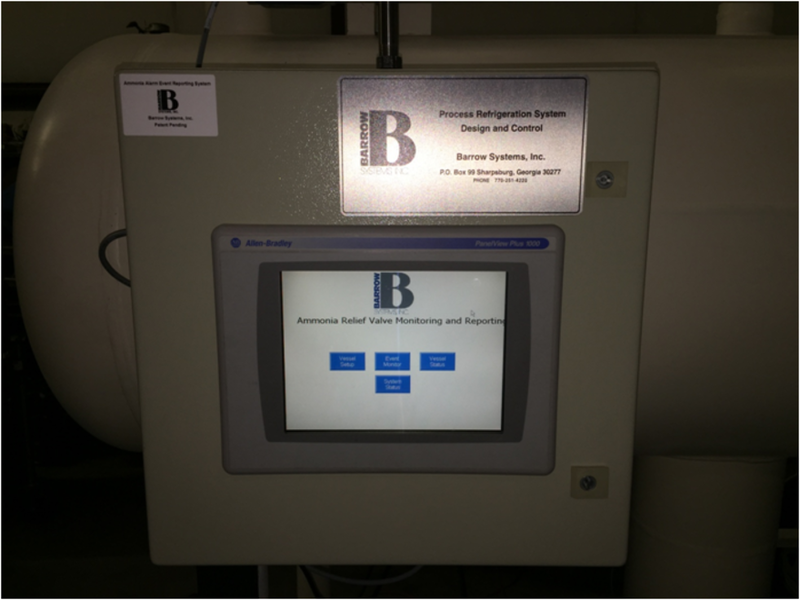 After extensive, full scale and real time testing, Barrow Systems applied for and received a full Patent for the ammonia Refrigerant Relief Valve Monitoring and Reporting System© (RRVMRS). The Patented RRVMR System generates the following indisputable information that accurately defines the refrigerant release event. An accurate, measurable real time start of a relief valve release event. An accurate, measurable real time end or termination of a relief valve release event. An accurate, measurable duration of a relief valve release event. A mathematical formula that defines the quantity of refrigerant loss at each pound of pressure and the duration of time at each pound of pressure as the vessel pressure reduces until event end or termination. Accurately identifies which relief valve released the refrigerant on a dual relief valve assembly so the relief valve can be replaced when the release event is complete. When evaluating the loss during a relief valve release event, it is important to realize that from the beginning of a release the refrigerant quantity through the relief valve is diminishing in rate as the pressure drops and will continue to diminish until the relief valve release event stops or is terminated. Quantity appears elusive at this point because the descending slope cannot be averaged. This is why it was determined that quantity at a pressure must be sampled more frequently during the release. The Real Time measurement of a relief valve release event is essential to accurately account for the loss of refrigerant. There must be a specific measurement of the time that the vessel pressure is at any given pressure during the relief valve release event. By combining the precisely measured time and the rated flow of ammonia vapor through the valve at any given pressure, an accurate accounting of the loss in pounds can be determined. When the relief valve release event is over, accurate recorded data is available to be reported through the facility’s emergency management protocol. There is no need for delay in reporting due to uncertainty. The reporting information is immediately available to be compliant with the National Response Center’s/EPA’s reporting requirements.